Isn’t it great to think that there are everyday poems, like Melmac dishes, that you can recite or read at almost any time? No special occasion necessary. The illustrations above and below are by Meg Wohberg who illustrated advertisements for baby-care products in the 1930’s and then worked on over 70 children’s books in the 1950s, 60s, and 70s. So her work might look familiar to people of a certain age and even younger. I read these poems without concern for their messages. 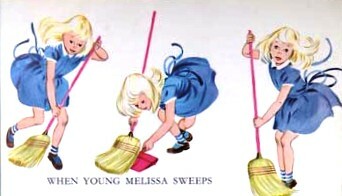 I’d read “When Young Melissa Sweeps” and want to go grab a broom. I don’t think I ever did it though, being a rather lazy child. But I’m sure some of my understanding of what it meant to be a girl came from these poems. So I learned how the world saw little girls but I learned a few vocabulary words, too. Poems introduced me to elements of culture I never experienced myself. 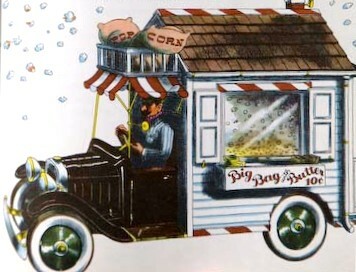 There were poems about the circus, the popcorn man, streetcars, and the sea. There was even one about telegraphs — a little outdated for the 1961 edition of Childcraft — but I knew what telegraphs were because I watched Westerns on TV. I think everyone my age remembers a bit of such poems as “When the Frost Is on the Pumpkin.” Many of us probably wondered what a shock of corn was when we’d read the poem in school in the fall. I’m sure that there’s something more contemporary that has replaced these poems. I know that I never read or heard most of the poems that my father learned in school and would recite to me on long drives. Classic poems like James Whitcomb Riley’s provide a shared experience with other Americans my age. This was the section where I found the best poems for memorizing. These are the poems I can still recite. I was disappointed that one of my favorite poems had no author noted. It must be a “traditional” poem, although I’ve never heard anyone but my sister or me recite it. I love the romanticism and surprise ending. I remember my father bringing home a reel-to-reel tape deck and recording that poem on it. Mom recorded the poem “Eletelephony” which I thought was hilarious. Both the poem and Mom’s voice coming out of a machine sent me into fits of giggles. The famous “Purple Cow” poem is also in this collection. I’m so sorry it caused Gelett Burgess, the author, so much grief. Sometimes the illustrations really made the poem. That was the case for “The Potatoes Dance,” I thought. 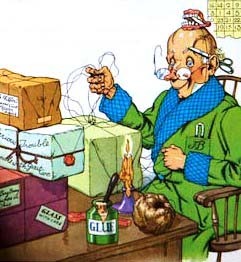 The illustrator’s taters were so much better than dull old Mr. Potato Head. Samuel Armstrong gave those spuds life. I had dreams about those potatoes. The burnt matchstick legs scared me. In my previous post I told you that my sister and I had competitions for who could memorize more poems. Since she was eight years older, I had a real challenge. I have a fond memory of sitting in the back of the neighbor’s station wagon waiting for fireworks to begin and my sister telling us a story she made up about Squidgicum-Squees. She got the idea from “The Raggedy Man” which was too long for me to memorize. It took up two entire pages! I was talking with my younger husband about how exciting it’s been to re-read all these poems. I then discovered that he had never heard of The Song of Hiawatha. How can a man who frequently drives Hiawatha Avenue, has been to both Gitche Gumee and Nokomis lakes, has probably walked past the Longfellow House at Minnehaha Park, not know this poem? I thought all native Minnesotans would have been forced to read it at some time or other. I guess not. Or not any more. After I read him the poem tonight I might try to memorize The Highwayman by Alfred Noyes. It should be a task made easier by Loreena McKennitt’s rendition as a song, although she leaves out several verses. Her song makes me cry. The poem is just lyrically satisfying and a good Gothic tale. I’ll end with another favorite from the humorous poems section. Forgets where he’s going an thinks he has gone. And always stands up when he’s sleeping in bed. Of trying to walk into yesterday. I ought to be able to do it,” says he. For he likes to save trouble and put it away. “O Jonathan Bing! What a way to behave! I always found it interesting that Jonathan Bing and Old Father William looked like the same man. They were drawn by someone with the initials of RL. For some reason Childcraft didn’t give credits for illustrations. Thank you for letting me share these with you. It’s been so much fun for me. Although, It does make me feel really old. And I’ve gone a little bit crazy trying to decide which poems are epic enough to warrant italics instead of quotes for their titles. Thanks, T. J. H., for this wonderful post. I, too, dreamed about those matchstick-limbed potatoes. Cherished books, images resonant for half a century! I’m looking for the poem about the little goblin that lost his “silver penny’ just as he crossed the street. “I met a little goblin a semperin’ and a soblin’ along the public way. Said I: Your spirits seem to fail you if I can aught avail you command me sir I pray. Said He: I have lost my penny, my shiny silver penny. For very joy I tost it just as the street I crossed it and now I’ve gone a lost it and oh my heart duth ache. Which Childcraft book is this poem in? 1939 or 1942? from the Childcraft books. The story of Darling Dilika Dolika Dinah.. I can remember only parts. My sister would read it to me when I was sick. We use to have to Childcraft books, but, they have been lost over the years. I would appreciate any copy of this particular story if it is possible. And–I grew up with an earlier edition of the Childcraft, but that poetry volume was much the same (probably identical, in fact, but with a different cover). I also loved the stories books. . .you could keep all the non-fiction stuff! Can you help me locate Little Joe Tunney from the child craft collection? “Little Joe Tunney” is by Rebecca McCann and appears on page 98 in my edition. I never read the poem because the illustration of Joe being held up by an elephant scared me. I figured that he was a bad boy and I knew enough about bad boys. He tried to be funny. To perform like a clown. “Oh, what shall I do? Put him back in his chair. For the rest of the show. The illustrator whose initials are R.L. was Robert Lawson. All illustrators’ names are listed in the first volume, “Poems of Early Childhood.” If you don’t have it, and would like the list, I can scan it for you. I also remember “Little Joe Tunney” from my childhood. The poem is so descriptive of the typical class show-off. Oh, geez, how did I not notice your response! I’ll scan them this week! Apologies! OK, I’ve scanned it, but I don’t have a place to upload it to–can I e-mail it to you somewhere? Please send to xteenb at gmail.com. And thank you! should be on its way–if it doesn’t show up reasonably soon, lemme know and I’ll try again! Thank you so much for ‘The Highwayman.’ Thank you for ALL the ChildCraft pix that were my friends when I was an only child. Very cool! Can someone please supply the name of the illustrator for “Loveliest of Trees”? Probably my favorite artist but many of the others are neck-and-neck for second and even first place. In fact, if someone has a list of Childcraft illustrators I’d be keen to see it. I have a set of Childcraft books cuz me dad sold encyclopedias door-to-door back in the before-time. The encyclopedias are gone but I still have the best of the Childcraft books. 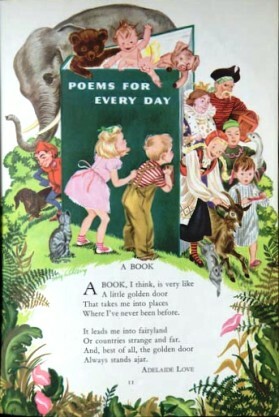 I loved these books as a child.. and have most of the volumes still the volume 1 Poems of Early Childhood is my favorite! I still use it often as an early childhood educator and the illustrations are timeless! Fair she was as a morning in May, when Hy Kokolorum stole her away. Nothing about him in anyway good! Catched her and snatched her and stole her away! Whom Hy Kokolorum had stolen away. Wicked as weasels and black as a crow. And-goodness gracious! what do you think? Crown and sceptre and everything! Thank you so much for this post! I have been looking for this book for ages but could not remember the name of it. I have just purchased a used copy and can’t wait till it’s delivered. I spent a lot of time with this book growing up. I’m grateful I found your post. Thanks again! The pictures of Hy Kokolorum in the Childcraft book was downright scary and probably gave many children nightmares. Loved Childcraft books so much as a child. I’m looking for a poem my mum once read to me that had the words “When the frost is on the Pumpkin” I know longer have the book but would appreciate it if you could tell me where I could find this poem. It’s “Punkin” not “Pumpkin” so that’s probably why you couldn’t find it. You can find the entire poem at http://www.bartleby.com/104/10.html. I always like the Riley’s phrase “the rooster’s hallylooyer.” I’m not sure anyone else hears that particular sound from the rooster but it beats cook-a-doodle-do. Thanks for sharing these great poems. I too have some of the best childhood memories around the poem book from the set. I was in a used bookstore yesterday looking for a copy. Hope I find one. Perhaps another verse . . . He met her in the meadow, when the sun was sinking down….. I am looking for that version.. I wish I knew that one. I wonder if it’s a variation created by someone trying to remember this one. I have been looking for the name of the illustrator RL with no success but that search led me to this entry. I just wanted you to know that I thoroughly enjoyed it..
I’m looking for the story (poem?) about a little boy who gets new boots but is so enchanted with them that he walks out of the store while staring at them. He is found by a policeman on a horse. The story was in Childcraft in the early 60’s,but I’m not sure of which edition. Thanks for your help! I am looking for a story, NOT THE POEM, from the Child Craft book series out in the 1950’s. This volume set of books had a red cover. The story was about a cow, and when he put on glasses he saw everything purple. I would love to read that story to my mother, who read it to me and is now 92, and also to my grandchildren. There’s the poem “Grandpa Dropped His Glasses,” but that’s not about a cow. The only cow story I found in Folk and Fairly Tales was “Gone is Gone.” But that has nothing to do with the color purple. Sorry.